A Japanese H-IIB rocket launches the HTV-5 cargo ship toward the International Space Station on Aug. 19, 2015. Among the 4.5 tons cargo riding on HTV-5 were several samples of liquor for the Suntory Global Innovation Center to test how booze mellows in space. Liquor is taking a trip across the final frontier to see how alcohol "mellows" in weightlessness. 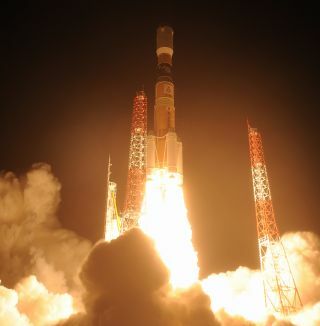 Tokyo-based Suntory Global Innovation Center, which has a division called Suntory Whiskey, launched a set of alcoholic beverages toward the International Space Station on Wednesday (Aug. 19) aboard Japan's fifth H-II Transfer Vehicle (HTV-5). The booze includes five different types of distilled spirits, Suntory representatives said. "With the exception of some items like beer, alcoholic beverages are widely known to develop a mellow flavor when aged for a long time. Although researchers have taken a variety of scientific approaches to elucidating the underlying mechanism, we still do not have a full picture of how this occurs," Suntory representatives wrote in a statement. "Our company has hypothesized that the formation of high-dimensional molecular structure consisting of water, ethanol and other ingredients in alcoholic beverages contributes to the development of mellowness, and we have been conducting collaborative researches on this topic," they added. Suntory's many brands include the whiskeys Jim Beam, Maker's Mark and Canadian Club, Hornitos tequila and the liqueur Midori. Company representatives didn't specify which products are on their way to the space station. Other collaborators on the liquor experiment include Shigenao Maruyama (with Tohoku University's Institute of Fluid Science) and Mitsuhiro Shibayama (who is with the University of Tokyo, the Japan Synchrotron Radiation Research Institute and the Suntory Foundation for Life Sciences). The liquor will be stored aboard the Kibo module of the International Space Station, which is run by the Japan Aerospace Exploration Agency (JAXA). Some of the samples will remain aboard the orbiting lab for one year, while others will be in space for two years or more. They will be tested once they return to Earth, and compared to control bottles that never left the ground. Alcohol and alcoholic ingredients have flown in space before. For example, an 11-year-old's brewery visited the orbiting lab in 2013, and yeast rocketed briefly into suborbitin 2014 (and was later incorporated into a new "space beer").